This holiday strip was actually one of the first ones I wrote. It was originally suppose to end with the Mouse saying "I hope you kept the receipt" and the Cat getting sad. 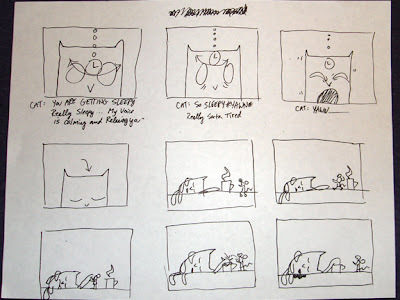 After I started writing more strips, I realized that this strip was way too short so I added the Cat throwing a trantrum and deciding to celebrate Hanukkah. That was the best I could come up with. I have to go wrap presents but maybe later in the week I'll post some more on this strip, because I like how I animated this one. Happy Holidays! 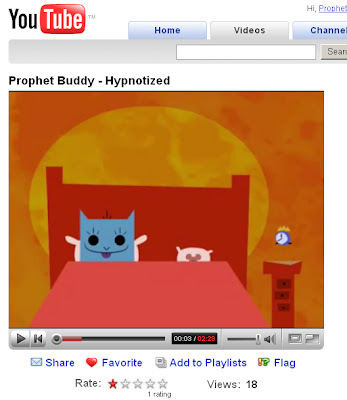 I've never seen anything on youtube with a 1 star rating. I'm blown away! I'd like to take this opportunity to thank all of my wonderful fans, friends, and family for all of the support! In 'The Future' the Cat has some pretty high goals, a 'public bus driver' and a 'fancy business tycoon'. My word of advice is to always aim low, it will turn that one star into a million! 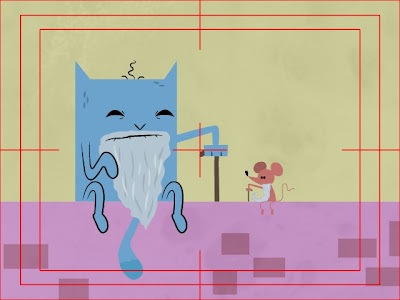 Also, some of you might think it's strange that the Cat and Mouse are old men with long beards in a year's time. My explanation is that animals age faster than humans, I don't even think mice live over a year. 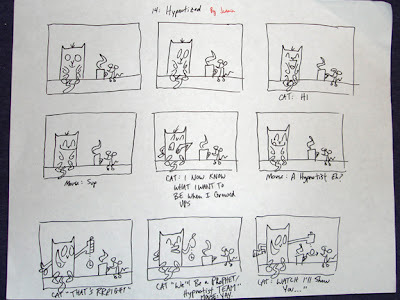 Here's some behind the scenes from the 'Hypnotized' strip. We record all of the dialogue in Matt's garage. 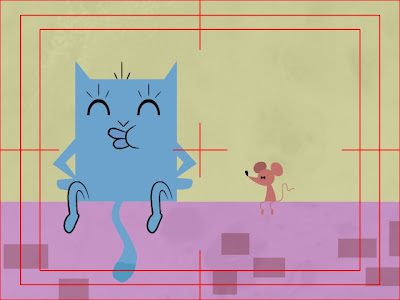 Eric and Matt go through the storyboard and recite the lines and add a few of their own. There's only one microphone so the voices are recorded separate from each other. Eric and Matt make several takes for each line. I usually pick the ones that make us laugh. As you can see it's a good time recording the dialogue. I'm very lucky to have my buddies, Eric and Matt lend their voices and insight to this series. It wouldn't be half as good without them! This strip is based off of a true story. I should've listened. Don't ask about the lips in the chew cycle, that's how I drew them in the storyboard. I usually stick really close to the poses I draw in the boards. Even though I already had a reusable chew cycle from the Harpies Outbreak strip, I still animated this new chew cycle, it's always nice to see something new everyonce in awhile. I've been told people appreciate that kind of stuff.